I’ve got a number of questions lately about carving tools. Which ones do I use, what do I recommend, etc. Here is some of the answer. The carving tools I use are a mixture of new & old. They all generally work, some better than others. I have some English, German, Swiss, American. I mostly lean towards the older tools; but I have many new (in the last 25 years) tools. Most of those are the Swiss-made tools, (Pfiel is the name of the company that makes them, I think). These days I have found some of their tools a little lightweight, which I don’t like. I imagine the “antique” tools I use are not all that old, maybe early-twentieth century. I have never really studied gouge-history, but I bet someone has and there must be a rundown of various gouge-making firms, like Butcher, Addis, Buck Bros, Henry Taylor. I have tools from all these & mostly like them. First, as for sizes. This picture is what I generally send people who ask what size tools do I use the most. 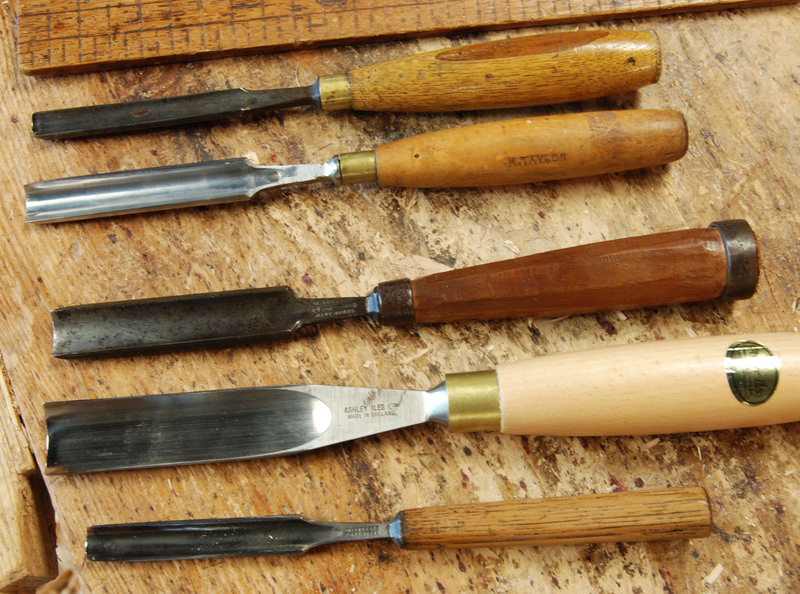 A set of gouges like this will go a long ways in carving 17th-century style patterns. I’ve collected my tools here & there over the years; and some have come from Alexander’s collection as well. (as always, thanks JA) As for manufacturers, I guess most of my old ones are British. There’s no magic in the British ones, but they are generally nice. The museum where I work once bought some tools, and in a money-saving mood, we chose the smaller versions of some Austrian tools, and I find them hard to use. I hit these things pretty hard, and the smaller tools feel like they can’t take it. I haven’t had a problem with them, I just don’t like the way they feel. I prefer a larger, full-size tool. Pfiel (sold through Woodcraft & elsewhere) make some carving tools in two sizes as well, so I recommend the bigger versions if you go that route. I bought some Ashley Iles last year from www.toolsforworkingwood.com and for new tools they seem well-made. They are large, and strong. This picture shows a bunch of tools I use a lot. From the top, two Henry Taylor gouges, one old one new. A W Butcher gouge, one of my favorites. Then a new Ashley Iles gouge, and a very nice, although small, Sheffield-made gouge. 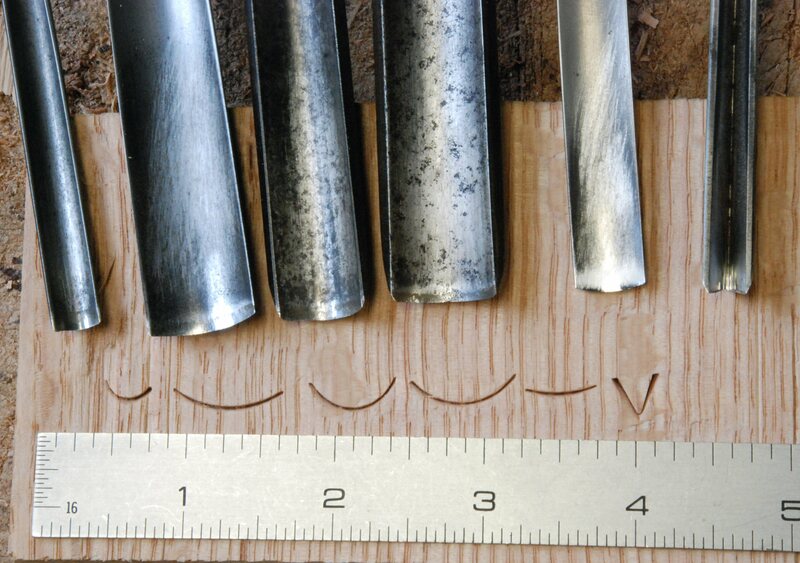 Here is a comparison between the two Henry Taylor gouges. I don’t think the “old” one is all that old, (I’d guess 25 years or so?) but there’s a noticeable difference between the two. see the detail of the bolsters, the new one doesn’t quite fit the ferrule that well, and the handle’s a little cockeyed too. Not a terrible big deal, but it makes the old one more appealing to me. This is one of my favorite gouges. Again, I doubt it’s all that old. But nice & stout where it needs to be, and well made. NOW, the V-tool is the real killer. It’s a hard tool to find one that’s the right shape. I have a Pfiel one that I bought 20+ years ago, and have changed its shape through sharpening over time, and I do most of my V-tool work with it. I have since bought new ones, same size, same maker. Different shape. Some of those failed (chipped cutting edge!) – I also have an old German one that I use a good bit. It’s a very nice example. This photo shows, from right to left, Pfiel, Ashley Iles, one from Hamburg (no name) and a Stubai from Austria. Look at the detail of their V-shapes, that’s the thing to look for. The closer it comes to an absolute point at the junction of both “wings” the better it is. That’s where the Stubai in this group loses out, the Pfiel and the German ones have the best shape. Ashley Iles is pretty good, probably better than the newer Pfiels I have bought in recent years. Here they run just as above, from the left, Stubai, German no-name, Ashely Iles, and Pfiel (Swiss-made). the German & Swiss are the best, cleanest cuts, sharpest lines. the other tw0, being a little rounded at the bottom, bump along a bit, leaving ridges inside the lines. Hope some of this helps with questions about carving tools. it’s a start anyway. I”ll be doing some more carving this summer, and will try to add some blog content here on the subject. Thanks Peter! I am getting interested in carving and you answered a lot of my questions. I had already found Chris Pye’s site, but I really like the photos and cutting examples in your post. One question: In the first photo, what are the approximate sweeps of the gouges? I thought of a couple more comments. 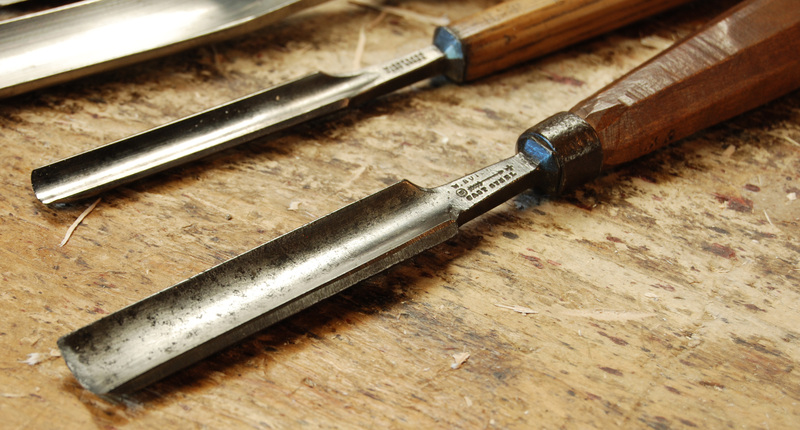 When buying carving gouges, there are two ways to go, old and new. 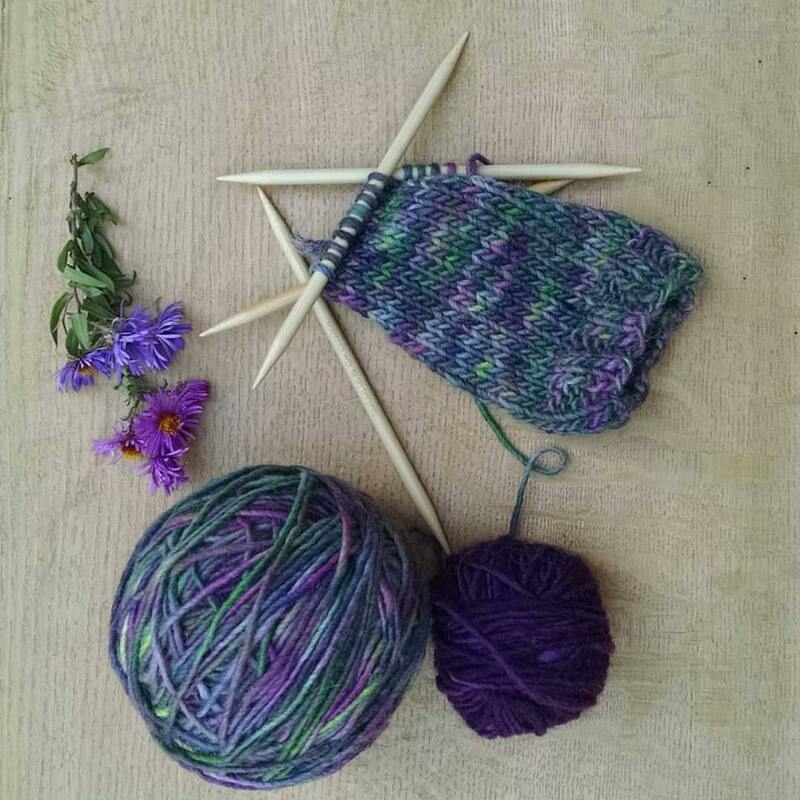 the nice thing about new tools is that you can find the size & shape you want readily; and they are usually either ready to use, or close to it. With older tools, there is often a lot of searching & hunting to find the shapes necessary. and some tinkering/sharpening sometimes to get them in shape. But I like the feel of the older tools in many cases. For new tools, the Ashley Iles are nice & stout, which I like. As for the “sweep” (the curvature of the cutting edge)each manufacturer uses different numbering systems to describe the curves of their tools. that’s why I shot the photo with the tools and their curvature cut in the oak, with the ruler for scale. Someone could print that, and generally knock it about until their print is to scale with the ruler. then they would have the shapes I use for many of my carvings. Peter: Thank you for the carving tool information. Your suggestion about printing your illustrations to scale rather than wandering through conflicting manufacturer sweep numbers is very helpful. You have oodles of gouges. A caution. If one is commencing, no need to buy too many. I note that your basic kit consists of six gouges. I recall that English Apprenticeship Indentures that award tools to an apprentice at the end of his term often include six gouges. The award of gouges seems to appear more common in earlier English Indentures at a time when carving was more common. You have read many more inventories from over home than I have. The only time I got there I was still a post and rung chair maker. What say you? When you replicate 17th Century carvings have you found a pressing need for more gouges? The English explicit Indentures are suggestive. Now for a toughie. Do you find a greater number of gouges used in English carving rather than New English? Disclaimer. My carving arose out of very good but short Follansbee course years ago. I have done little but the very simplest of carving on stool aprons. Thanks for the information on carving tools. Very helpful, and exactly what I was looking for. You’re a wealth of information. 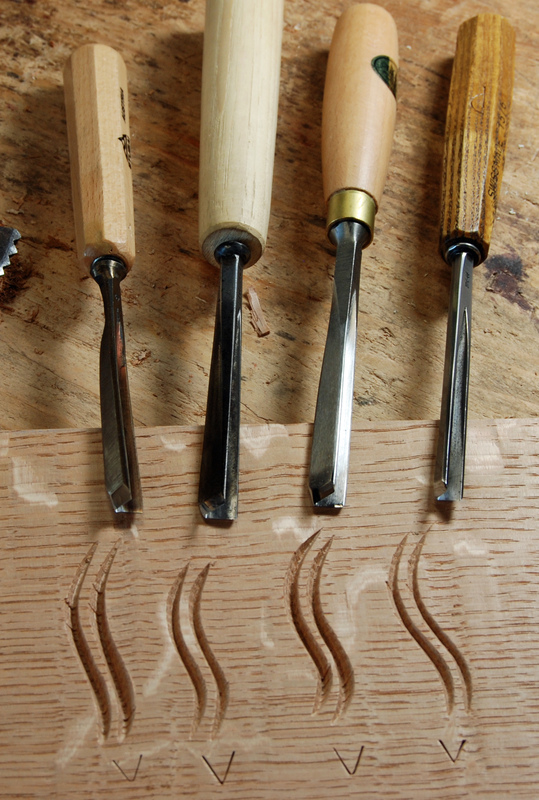 Thank you so much for this blog post … I now feel much more prepared to purchase my first set of carving chisels and start practicing. Very helpful information on carving tools, Peter. I would agree that Chris Pye’s website and books are the place to turn for incredibly detailed guidance on sharpening and just about everything else related to carving. Also, it appears that the V tools you show are all 60 degree. V tools come in a few angles — 45, 60, 90, probably others too. Do you ever have a call for a V tool other than the 60 degree? On a whim, I searched your name on the internet and found you. What you are doing now is no surprize to me. Your success and intricate skills just needed to find the right medium. That said, finding where in “art” you belong can be no easy feat. And, it seems your quest was a very rewarding and passionate one. The dividends paid are exquisite works of art. Moreover, the process “is” the art, and the final product just a reflection of the artists skills in knowing and making the process work. I am proud to have known you, even if it was only for a short period of time, long long ago. Most importantly, I am thrilled you have found your passion. Great article. 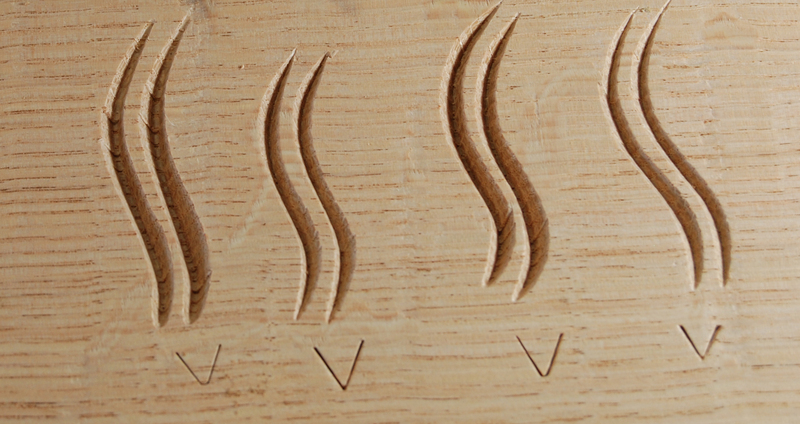 Just started carving this year and bought a cheap set of chisels from Ebay… big mistake.. learned the hard way that the quality of carving tools has big impact on the quality of the work.